There is a new version of UEFI MULTI available with new Grub4dos SVBus menu entries. Mapping for VHD WIMBOOT is taken into account for various cases e.g VHD + WIM on USB Or on Internal Harddisk. 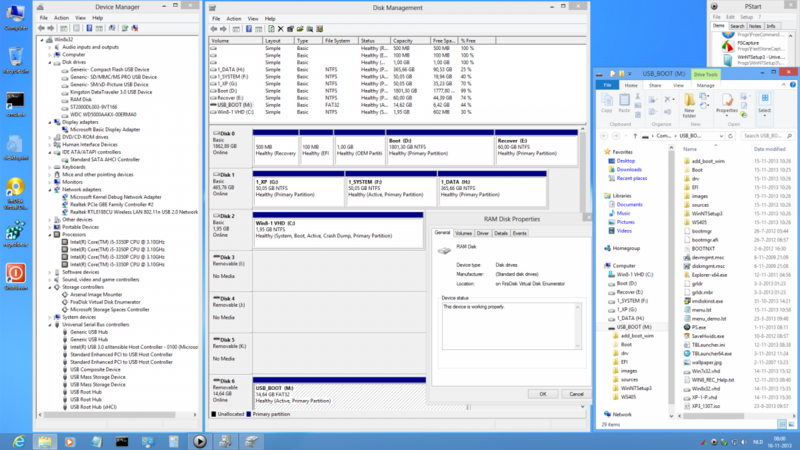 UEFI_MULTI determines the Drive Number for the MountPoint of the selected NTFS System Drive where the VHD resides. 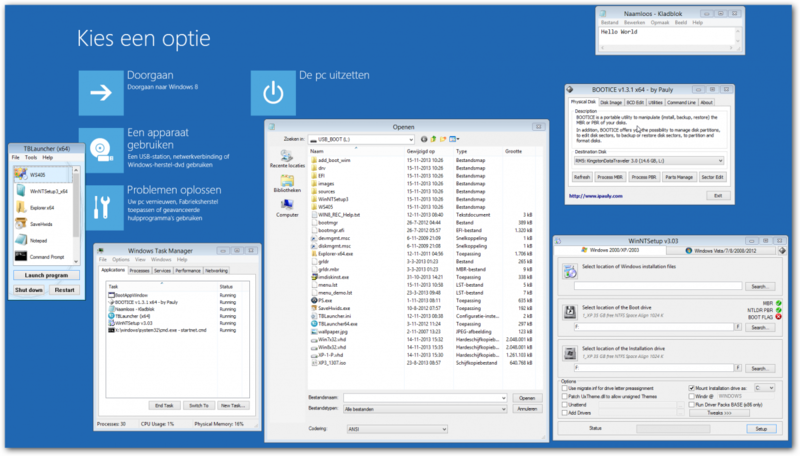 UEFI_MULTI determines the DriveType and Bus Type of the selected NTFS System Drive. and the program knows the Windows disk number which is used in menu.lst entries for WIMBOOT mapping in case the VHD + WIM are located on Internal Harddisk. Best Results for speed of Portable VHD WIMBOOT obtained with SAMSUNG Portable SSD T5 250 GB with UEFI/MBR Partitioning with 20 GB FAT32 and 230 GB NTFS partition. as very fast Portable and always FRESH Operating System. The only limitation is that booting from RAMDISK requires booting in BIOS mode with Grub4dos. But anyway booting from Windows Boot Manager menu as FILEDISK using Microsoft vhdmp.sys driver is available in BIOS and in UEFI Secure mode. so that it can be located in VHD of Size 2 GB with total boottime 30 seconds which is OK.
Are you really sure-sure they could/can not? Well, I had bad experience with Win7 PE before. 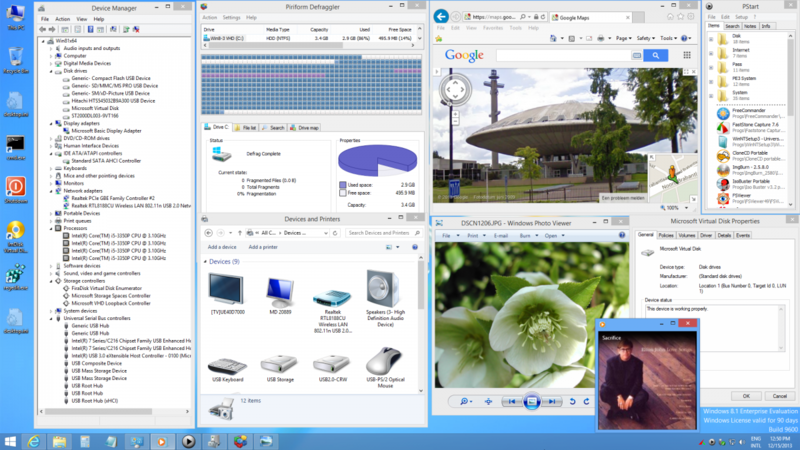 First, there are many USB 3.0 controller, not the Intel which is later much supported using NUSB3. One of my system uses Fresco Logic Controller, I have integrated this driver inside Win7PE using Make_PE3. 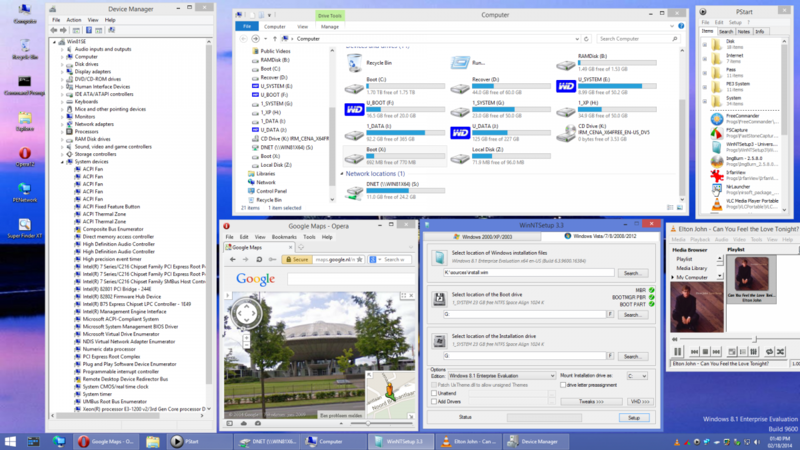 - Once booted on USB 2.0, the USB 3.0 port can be used as USB 3.0. - On my 'old' system, there is no option (as on newer machine) to set in BIOS to support xHCI for program requiring it at boot time (so no way to benefit from USB 3.0 boot). - The USB 3.0 port does not show up at boot time (when an external USB HDD 2.0/3.0 is plugged). - On newer machine, where USB 3.0 is supported in BIOS and presented for HDD boot selection, with Win7PE I got the classical BSOD 0x7B. No time to investigate it (probably to change the startup type of driver?). With Win8-32/64 full VHD, now no problem direct booting with USB 3;0, no more BSOD 0x7B (or equivalent screen), no tweak required! No problem of SxS, missing .Net framework, not functioning 32-bit portable applicatons... Ubuntu got this function long time before Windows: installation to USB HDD, boot anywhere. No time to investigate it (probably to change the startup type of driver?). And/or CriticalDeviceDataBase or Load Order. You are right. I just checked again booting Win7PE-x86 made with make_PE3 through a machine with BIOS supported USB 3.0. It works! It looks like wimb has included all drivers and tweaks to make this happen. Info: The header checksum for this file doesn't match the computed checksum. Later boots are OK, no more problem (second boot has a transient patch application). I used Win7-64 Ultimate. May be can you try if Win7-x64.vhd can be used to boot in UEFI mode. Thanks for testing. Good to know that it can work. It have real surprise by measuring boot time for my VHDs. They are not fragmented (1 or 2 fragments max). All VHD have System restore Off, UAC off, no pagefile, Windows Defender disabled, fresh install. So the surprise is very fast boot time with USB key. I will measure boot time with USB 3.0 port too. Even Win7PE (which is not a full Win7-32) takes longer time that booting full Win8 VHD. Note: boot time = time after that the user gets the desktop and can run any other programs or activities. In fact the method seems to work also for removable USB key (stick), and not only for hard disk. One can use appropriate paritioning tool (e.g. bootice version 0.78) to partition the USB key into two partitions, a small one in FAT32, and another one in NTFS for data. By using either wimb's USB_part_flip utility or Pauly's bootice version 0.78 (this version precisely), it is very easy to make the desired partition visible to Windows (remember: only the first partition entry of USB key MBR is visible to Windows). So now we could have a handy, light USB key that is UEFI Multiboot capable, without requiring changing BIOS/UEFI settings to enable legacy/CSM module and disable Secureboot. USB 3.0 sticks (at least the "high end" ones) are NOT anymore "flash sticks"
They are actually a USB 3.0 to SATA bridge + a SSD. No particular surprise to find out that they are as fast as or faster than a "conventional" hard disk, as a matter of fact their speed should be compared to that of a "normal" SSD inside an external USB 3.0 case. If you prefer on a "conventional" stick the bottleneck is the Flash speed (and not the USB 2.0 bus), whilst with hard disk (on USB 2.0 bus) the bottleneck is the bus itself. A typical "old" stick is around (very roughly) 20 Mb/sec, while USB 2.0 hard disks are around the 40 Mb/sec mark. A SSD being actually faster than a hard disk, will be (on USB 2.0) as fast as the bottleneck, i.e. around 40 Mb/sec, i.e. twice the speed of a Flash stick, and thus taking roughly half the time in booting. Thank you for the links. These products are attractive, but still expensive. The Kingston key 250 MB/s is guaranted only 2 years (vs. lifetime with Sandisk Cruzer Extreme USB 3.0 190 MB/s). And of course from users review there are heat problem. And the announced performance is only for big files, not for small one. For this purpose I make use of key F12 that is normally used for PXE boot from Network. When I press again F12 at the second beep then I get PXE Boot ROM and can boot from Network or press Esc to boot Next device e.g. USB-Stick with Grub4dos Menu. Next device booting in BIOS compatible mode can be USB-Stick or portable USB-Harddisk or second internal Harddisk depending on BIOS Boot sequence settings. When pressing F8 at second beep then I get BIOS Boot Menu that allows me to select next device for booting into BIOS mode. 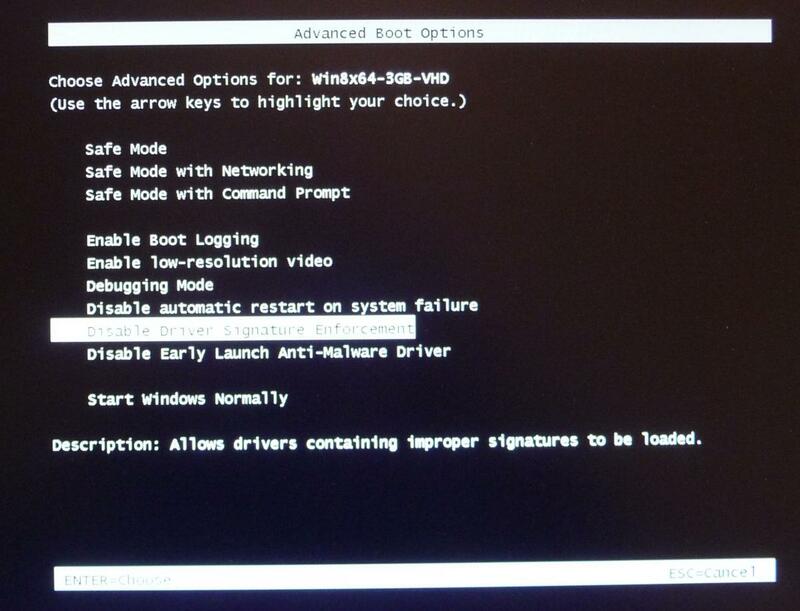 in Boot Manager menu press F8 to use Advanced Boot Options - Disable Driver Signature Enforcement. Testsigning Yes in BCD Menu is NOT enough, but need to be confirmed in this way. Tool to make USB-Stick having two partitions - FAT32 Boot partition for WIM or ISO and NTFS System partition for VHD. Option to Install Grub4dos in MBR BootCode, which allows BIOS computer to boot directly from USB with Grub4dos Menu. 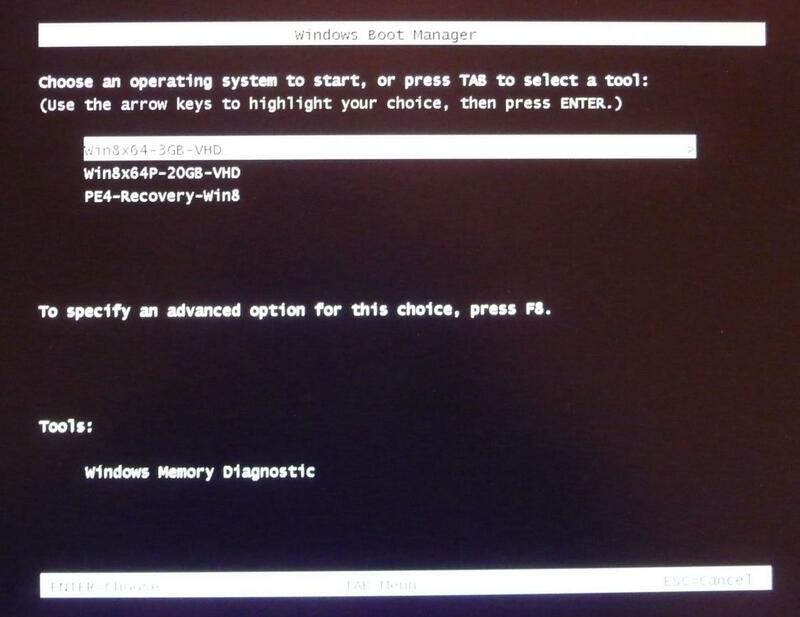 Option to make Boot Manager and Grub4dos Menu on UFD to boot UEFI + BIOS directly from USB with Boot Manager Menu. 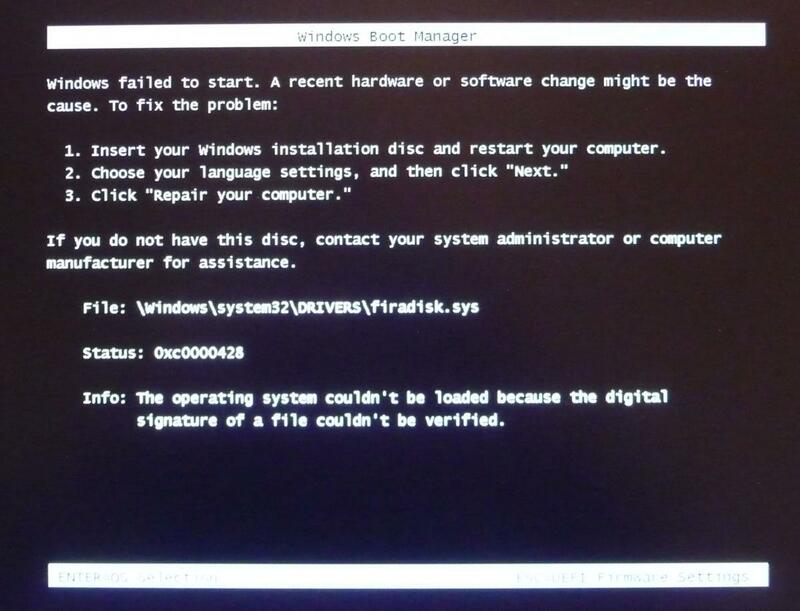 Windows 7/8 or 7PE is needed to make Boot Manager Menu and Win8 x64 is needed to make UEFI Boot Manager Menu. Why is the system partition so large? Does it actually need to be 50gb? You can use smaller size if it is enough for your needs. 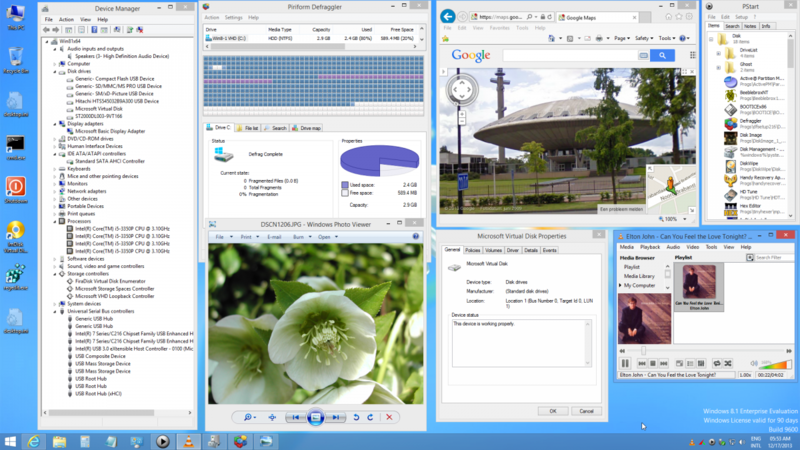 In my case I would like to have enough space for XP/7/8_x86/x64 VHD plus space for 7 or 8 x64 installed to partition. In that case 50 GB is really needed and I have enough space available on portable USB harddisk. May be 30 GB will do when you locate the VHD's on the DATA partition (primary NTFS). Does this support secure boot? I already have reserved space on such drive, hard to convert to MBR due drive's size is >2TB. Can I get some hint about required partitions layout? I mainly intend this to multiboot into Windows 8 installation media together with several bootable ISOs I pick. I expect that UEFI_MULTI.exe can be used with GPT drive, but have not tested GPT yet. In any case you need a FAT32 Set Active Boot partition, that is visible as Drive and can be selected in UEFI_MULTI.exe as Target USB Boot Drive.